The wonderful and multi-award-winning Gopal's Curry Shack will be serving up various special dals and pulse dishes as part of the British Dal Festival Dal Trail. 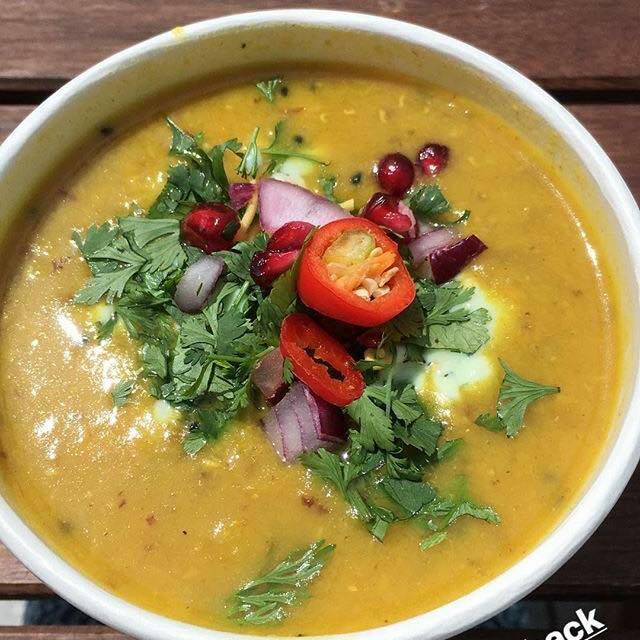 We're delighted that they've shared Mel's closely guarded recipe for this sumptuous coconut dal otherwise know as "Roald Dal". Thoroughly rinse the lentils until the water runs clear. Cover and soak for 10 mins, then drain. Put the lentils in a large saucepan with around 1 litre of cold water, the cinnamon stick and the turmeric and bring to the boil. Skim off any froth that surfaces and simmer for one hour or until the lentils are cooked. You may need to top up the dal with extra water if it starts to thicken too much-you are aiming for a soupy texture at the end. In a frying pan over a medium heat add the oil, then fry the onion until soft and golden brown – about 10 minutes. Add the garlic and grated ginger and continue to fry for a further three minutes. In a separate dry frying pan, gently toast the cumin seeds & mustard seeds until the mustard seeds start to pop. Add the spiced onion mix and the seeds into the dal, season to taste.